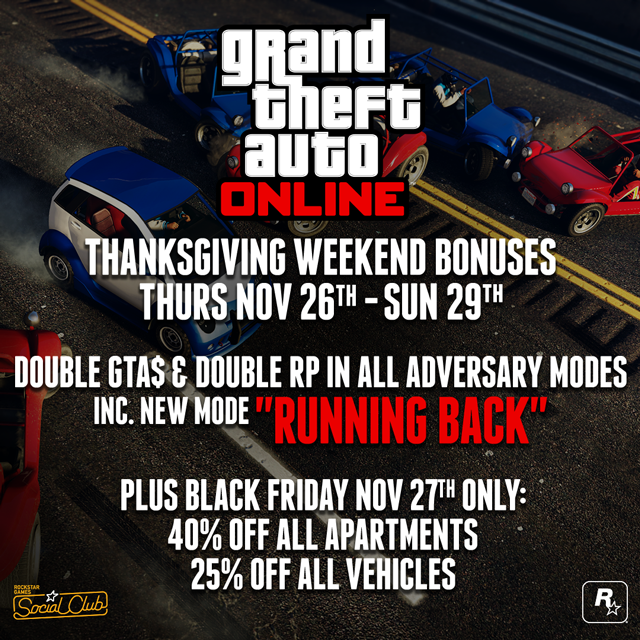 Be sure to play around in GTA Online this Thanksgiving weekend for Adversary Mode bonuses and epic discounts. On top of Double GTA$ and RP for ALL Adversary Modes on all platforms, there’s a special Event Playlist for PS4, Xbox One and PC players featuring all three variations of the Running Back Adversary Mode that just launched yesterday and more! Reap double the GTA$ & RP in all GTA Online Adversary Modes for four straight days, including everything from OG favorites like Come Out To Play and Siege Mentality, to recent releases like Hunting Pack, Slasher and the aforementioned Running Back. 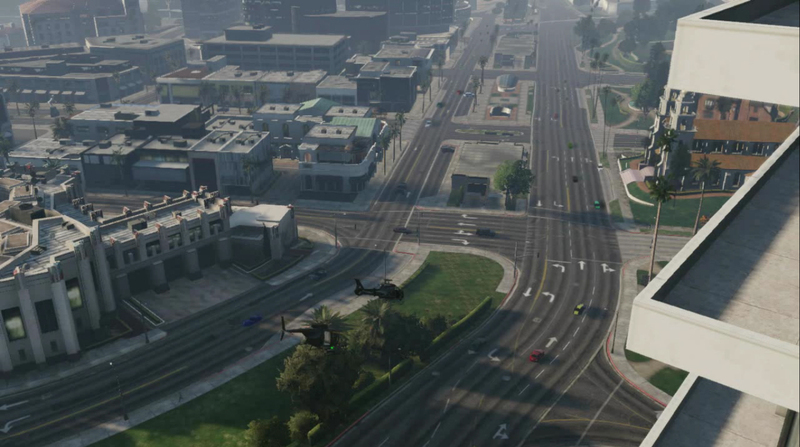 This latest Adversary Mode is perfect for any game day weekend with teams battling it out in an impromptu 2-minute drill on the Los Santos highway gridiron. You'll also be able to launch into a special Adversary Mode Playlist all weekend long on PS4, Xbox One, and PC straight from the GTAV launch screens. If you're already in-game, or want to play with just friends or Crewmates, simply go to the Rockstar Playlists section of the pause menu and select the Thanksgiving Playlist option. This Black Friday, November 27th, take advantage of a pair of GTA Online sales running across all platforms (including PS3 and Xbox 360). To make sure you have the proper pad for entertaining holiday guests, Dynasty 8 is offering 40% off all Apartments. And to ensure you’ve got one of the sleekest collection of sleds in Southern San Andreas, all Vehicles will be 25% off. So for those looking to expand to a fourth property in GTA Online or complete their collection of Lowriders, make sure to mark this Friday on your calendar! GTAO Thanksgiving Specials - Fun for all platforms kicks off tomorrow to celebrate Thanksgiving.